FREE POSTAGE to UK customers by fast insured Next Day Special Delivery. Please enter promotional code NCD10 in the discount box on your order form & click recalculate for £10 off your first order! Ordering is easy. Simply add the item/s you wish to purchase to the shopping basket. Choose either UK or INTERNATIONAL postage from the drop down menu & then click GO TO PAYMENTS or CHECK OUT WITH PAYPAL. The PAYPAL button allows you to log straight into your account & processes your order immediately. You can also click on this button if you want to sign up for a Paypal account. If you want to pay by Credit Card, Cheque or Postal Order, then click on the GO TO PAYMENTS button & fill out the required information on the ordering & payment forms. If you are a UK customer paying by Cheque or Postal Order, then please send your payment to the address given under the payment options on the payment form. Orders placed on a weekday will be dispatched the same day if ordered before 12 noon. Orders placed after 12 noon will be dispatched the following day. Orders placed over the weekend and on bank holidays will be dispatched on the next working day. Please note that orders paid for by Cheque & E-Cheque will not be dispatched until payment has cleared. Orders paid for by Postal Order will be dispatched once received, providing they are UNCROSSED. 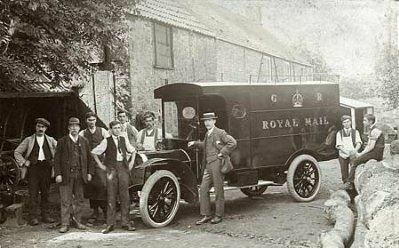 Orders sent by Royal Mail Special Delivery (our usual postage method) will arrive the following day after dispatch. Orders sent by Royal Mail Recorded Delivery will arrive in 24 to 48 hours. Orders sent by Parcelforce Express will arrive within 24 to 48 hours, depending on which service of theirs we use. Please see the notes about Parcelforce Express in the postage details below. We are not responsible for late deliveries caused by Royal Mail or Parcelforce failures, but will endeavour to rectify the issue with these services. Please contact us if your order is late arriving. Postage is FREE by Royal Mail Next Day Special Delivery. (We occasionally use other services - please see the notes below). Compensation of up to £2,500 for any orders that get lost or damaged in the post. A speedy service - all orders dispatched on a weekday are guaranteed to be delivered by 1pm the following day (Except on rare occasions when adverse weather conditions or postal strikes delay delivery. If this applies at the time of your order, we will inform you of this when we email you your order conformation). Special Delivery orders are usually handled with extra care, as they do not get sent with the huge amounts of standard post. Notes: We occasionally use Parcelforce Express 24hr or 48hr delivery, if a box is particularly large or heavy, and we use Royal Mail 1st class Recorded Delivery for boxes priced at £50 or under. These services include compensation against loss or damage. If we intend to use any of these services it will be stated on the description of the box, under the postage details. Postage is FREE no matter how many items you order! Orders placed on a weekday will be dispatched within 24 hours. Orders placed over the weekend or on a UK bank holiday will be dispatched on the next working day. Please note that orders paid for by E-Cheque will not be dispatched until payment has cleared. International orders will be sent by Royal Mail International Tracked and/or Signed For Airmail services. The service we use depends on which country you live in. These services protect you against postal loss. If your order gets lost then Royal Mail will compensate you up to £500. International orders are usually delivered within 3-5 working days to Europe, and 5-7 working days to the rest of the world. Delivery may occasionally take a little longer depending on the speed of your local postal service. Orders usually arrive in their designated countries within 24 hours of dispatch, at which point the postal services of the designated countries take over. International orders are occasionally delayed because of a hold up at customs. Notes: We occasionally use Parcelforce Global Priority delivery and TNT Express postage, if a box is particularly large and/or heavy. These services include compensation against loss or damage. If we intend to use either of these services it will be stated on the description of the box, under the postage details. Delivery times are the same as the above services. Very occasionally, when a box is extremely large or heavy, we may not be able to offer International postage. If this is the case it will be stated on the description of the box, under the postage details. Please check the postage details before placing your order. We are not responsible for late deliveries caused by Royal Mail, Parcelforce, or TNT Express failures, or by failures/delays at customs by the postal services in designated countries. In these cases we will endeavour to rectify the issue with the service/s involved. Please contact us if your order is late arriving. Postage is usually £25.00 for our International customers. (Please see below for multiple purchases). Please note: Occasionally when a box is large and/or heavy, we will need to add a surcharge to the £25.00 International shipping fee. If this is necessary it will be stated on the description of the box, under the postage details, and the surcharge fee will be shown. Please contact us prior to ordering if a surcharge is required, so that we can add the applicable fee. Multiple purchases: Please contact us prior to ordering if you are purchasing more than one box. Due to the high cost of International postage, we will need to add a postage fee for each box purchased.